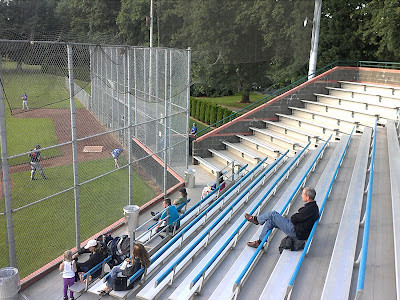 I've spilled more than a few pixels in the last few weeks whining about how Olympia doesn't have a real baseball or soccer stadium. I've presented options for $4 million stadiums. But, you know, in the end, what I really want is one small $600,000 stadium to call my own. 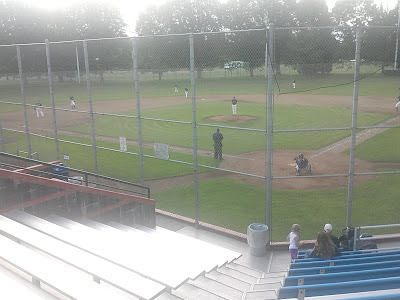 I was down in the Portland area in the last few days, and I was able to take in a few innings of a Northwest Independent Baseball League (which I wrote about earlier here) game between the Portland Titans and Royals at Schavone Stadium. Schavone is a nice little park. Built in the early 1990s for what would today be $600,000, Sckavone sits on the site of an 1940s era wooden stadium with the same name. 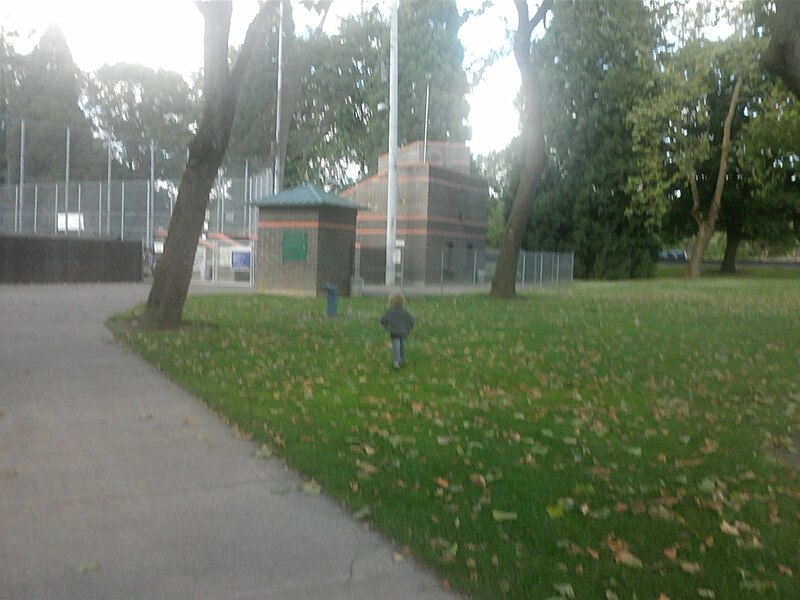 Walking to the stadium through the park setting. Sitting high in the cinder block grand stand, on aluminum bleachers. 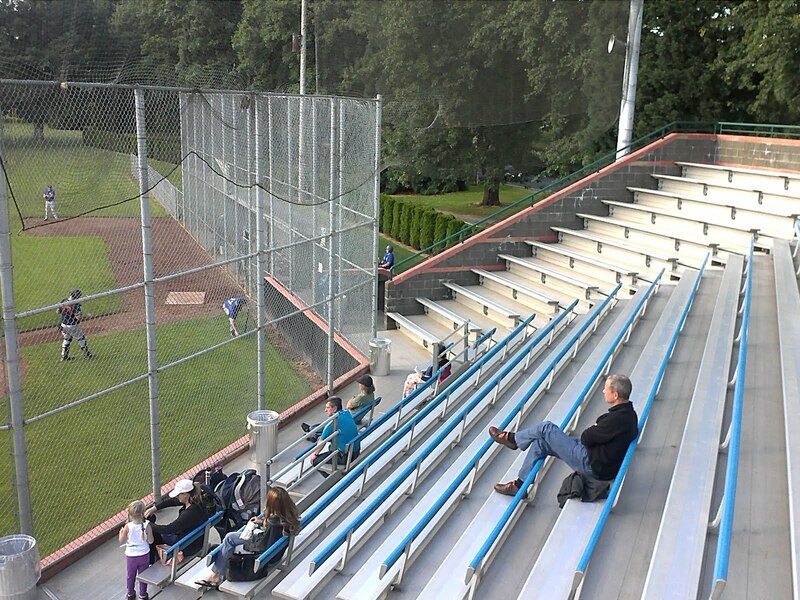 A little better view of the grandstands and what is probably an average crowd at a NWIBL game. What you can't see from this view is the press box up behind the grandstand and the lights. I'd imagine anything much more than this would be a full feature minor league stadium. Sckavone would, I imagine, be a proper home to a West Coast League standard team. It was also nice to get out to a NWIBL game. The two teams I watched were obviously amateur level, but a good amateur standard. It was unmistakably hard-ball, with a handful of better than average players. It was certainly worth the time and price of admission (free). I could imagine regularly getting out to these game if I lived in the area. But, where to put something like this around here? Where the old Steven's Field used to be (currently hosting two softball fields with lights)? Olympia, Capital or some other HS?